Supporters of public education are pledging to do all kind of wild things—including self-imposed vacations from the Internet—as part of an innovative crowdfunding effort to support scholarships. Would you walk around dressed as a fuzzy yellow mollusk for the sake of public education? UC Santa Cruz Chancellor George Blumenthal has promised to get on stage and sing. 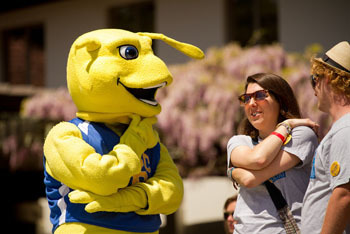 Others have pledged to don a Sammy the Banana Slug costume, give up coffee, and wear a tutu to work for a month. The reason for all this odd behavior? It's part of a creative crowdfunding effort taking place from Sept. 18 to Oct. 30 at UCSC and throughout the rest of the University of California system. The goal is to raise need-based scholarships and grants for Californian students hit by rising college costs — especially those from middle-class families who don't qualify for as much traditional financial aid. For generations, the University of California has provided the brightest Californians access to a world-class education at an affordable price. But state cutbacks over the past five years have meant that instead of California covering 78 percent of a student's education costs, it now covers just 39 percent. At UCSC, nearly 78 percent of students apply for some kind of need-based financial aid. Many take on loans and part-time jobs to pay for their education. That's why UC Santa Cruz is participating in the system-wide Promise for Education effort, which will provide direct scholarships and grants to undergraduates from California who need financial help. The dollars raised will be in addition to money students already receive from traditional financial aid programs. The idea is simple — and fun. 1.) Starting Sept. 18 alumni, students, faculty, staff, celebrities, and political leaders — anyone, really — can log on to PromiseForEducation.org and make a promise. The promises can be inspiring, quirky, motivating, or adventurous. Learn Klingon? Run a marathon? Any creative undertaking works. 2.) The promise-maker sets a crowdfunding goal. It can be any amount, from $100 to $25,000. 3.) The promise-maker blasts their promise and fundraising goal via social media like Facebook or Twitter, and/or email. 4.) Recipients are directed to a promise-maker's personalized page on PromiseForEducation.org where they can contribute money toward the set goal. 5.) Funds may be designated for a particular campus like UC Santa Cruz, or the entire UC system, and will go directly to help fund scholarships for students. 6.) When the fundraising goal is met, the promise-maker must perform his or her promise! Promisors are asked to share proof of the completion of the promise on the website so all of their supporters can see. UCSC Chancellor Blumenthal has set a personal fundraising goal of $10,000 and is already warming up his voice. He's also urging others to either create their own promises and begin fundraising themselves, or log onto PromiseForEducation.org and find a promise that inspires them to give. It's a great way to make a difference in a deserving student's life. For more information, please contact Howard Heevner at hheevner@ucsc.edu.